This is a list of artists who actively explored mathematics in their artworks. Art forms practised by these artists include painting, sculpture, architecture, textiles and origami. Some artists such as Piero della Francesca and Luca Pacioli went so far as to write books on mathematics in art. Della Francesca wrote books on solid geometry and the emerging field of perspective, including De Prospectiva Pingendi (On Perspective for Painting), Trattato d’Abaco (Abacus Treatise), and De corporibus regularibus (Regular Solids), while Pacioli wrote De divina proportione (On Divine Proportion), with illustrations by Leonardo da Vinci, at the end of the fifteenth century. Merely making accepted use of some aspect of mathematics such as perspective does not qualify an artist for admission to this list. The term "fine art" is used conventionally to cover the output of artists who produce a combination of paintings, drawings and sculptures. ^ Benford, Susan. "Famous Paintings: The Battle of San Romano". Masterpiece Cards. Retrieved 8 June 2015. ^ "Mathematical Imagery: Mathematical Concepts Illustrated by Hamid Naderi Yeganeh". American Mathematical Society. Retrieved 8 June 2015. ^ a b c d e f "Monthly essays on mathematical topics: Mathematics and Art". American Mathematical Society. Retrieved 7 June 2015. ^ Piero della Francesca, De Prospectiva Pingendi, ed. G. Nicco Fasola, 2 vols., Florence (1942). ^ Piero della Francesca, Trattato d'Abaco, ed. G. Arrighi, Pisa (1970). ^ Piero della Francesca, L'opera "De corporibus regularibus" di Pietro Franceschi detto della Francesca usurpata da Fra Luca Pacioli, ed. G. Mancini, Rome, (1916). ^ Swetz, Frank J.; Katz, Victor J. "Mathematical Treasures - De Divina Proportione, by Luca Pacioli". Mathematical Association of America. Retrieved 7 June 2015. ^ Greene, Robert. "How Santiago Calatrava blurred the lines between architecture and engineering to make buildings move". Arch daily. Retrieved 7 June 2015. ^ a b c d "Feature Column from the AMS". American Mathematical Society. Retrieved 7 June 2015. ^ "Leonardo DaVinci and the Golden Section". University of Regina. Retrieved 7 June 2015. ^ Field, J. V. (2005). Piero della Francesca. A Mathematician’s Art (PDF). Yale University Press. ISBN 0-300-10342-5. ^ Yuan, Elizabeth (2 July 2014). "Video: Origami Artists Don't Fold Under Pressure". The Wall Street Journal. ^ Demaine, Erik; Demaine, Martin. 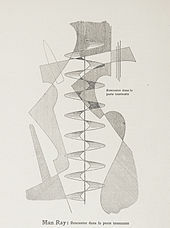 "Curved-Crease Sculpture". Retrieved 8 June 2015. ^ "Erik Demaine and Martin Demaine". MoMA. Museum of Modern Art. Retrieved 8 June 2015. ^ Dietz, Ada K. (1949). Algebraic Expressions in Handwoven Textiles (PDF). Louisville, Kentucky: The Little Loomhouse. ^ Birch, K. (20 August 2007). "Cogito Interview: Damien Jones, Fractal Artist". ^ Bamberger, A. (2007-01-18). "San Francisco Art Galleries - Openings". Retrieved 2008-03-11. ^ "Gallery representing Draves' video art". Archived from the original on 2008-06-06. Retrieved 2008-03-11. ^ "VJ: It's not a disease". Keyboard Magazine. April 2005. ^ Wilkinson, Alec (2004-06-07). "Incomprehensible". New Yorker Magazine. ^ "Albrecht Dürer". University of St Andrews. Retrieved 7 June 2015. ^ Beineke, Lowell; Wilson, Robin (2010). "The Early History of the Brick Factory Problem". The Mathematical Intelligencer. 32 (2): 41–48. doi:10.1007/s00283-009-9120-4. ^ Ernest, Paul. "John Ernest, A Mathematical Artist". University of Exeter. Retrieved 7 June 2015. ^ "M.C. Escher and Hyperbolic Geometry". The Math Explorers' Club. 2009. Retrieved 7 June 2015. ^ "BBC 100 Women 2015: Iranian artist Monir Farmanfarmaian". BBC. 26 November 2015. Retrieved 27 November 2015. ^ Smith, Roberta (17 December 2009). "Peter Forakis, a Sculptor of Geometric Forms, Is Dead at 82". The New York Times. Often consisting of repeating, flattened volumes tilted on a corner, Mr. Forakis’s work had a mathematical demeanor; sometimes it evoked the black, chunky forms of the Minimalist sculptor Tony Smith. ^ "Peter Forakis, Originator of Geometry-Based Sculpture, Dies at 82". Art Daily. Retrieved 7 June 2015. ^ "The Math Geek Holiday Gift Guide". Scientific American. November 23, 2014. Retrieved June 7, 2015. ^ Hanna, Raven. "Gallery: Bathsheba Grossman". Symmetry Magazine. Retrieved 7 June 2015. ^ "George W. Hart". Bridges Math Art. Retrieved 7 June 2015. ^ "George Hart". Simons Foundation. Retrieved 7 June 2015. ^ "Anthony Hill". Artimage. Retrieved 7 June 2015. ^ Friedman, Nathaniel (July 2007). "Robert Longhurst: Three Sculptures". Hyperseeing: 9–12. The surfaces [of Longhurst's sculptures] generally have appealing sections with negative curvature (saddle surfaces). This is a natural intuitive result of Longhurst's feeling for satisfying shape rather than a mathematically deduced result. ^ "Man Ray–Human Equations A Journey from Mathematics to Shakespeare February 7 - May 10, 2015". Phillips Collection. Retrieved 7 June 2015. ^ Bellos, Alex (24 February 2015). "Catch of the day: mathematician nets weird, complex fish". The Guardian. ^ "Continents, Math Explorers' Club, and "I use math for…"". mathmunch.org. April 2015. Retrieved June 7, 2015. ^ Hart, George. "Luca Pacioli's Polyhedra". Retrieved 7 June 2015. ^ "Dodecahedron". Wolfram MathWorld. Retrieved 7 June 2015. ^ William Grimes (11 February 2011). "Charles O. Perry Dies at 81; Sculptor Inspired by Geometry". New York Times. Retrieved November 10, 2012. ^ Radcliff, Carter; Kozloff, Joyce; Kushner, Robert (2011). Tony Robbin: A Retrospective. Hudson Hills Press. ISBN 1-555-95367-0. ^ "Hiroshi Sugimoto: Conceptual Forms and Mathematical Models". Phillips Collection. Retrieved 9 June 2015. ^ "art21: Hiroshi Sugimoto". PBS. Retrieved 9 June 2015. ^ "A Cuddly, Crocheted Klein Quartic Curve". Scientific American. 17 November 2013. Retrieved 7 June 2015. ^ "Paolo Uccello". J. Paul Getty Museum. Retrieved 7 June 2015. ^ "The Battle of San Romano, Paolo Uccello (c1435-60)". The Guardian. 29 March 2003. Retrieved 7 June 2015. it is his bold enjoyment of its mathematical development of shapes - the lances as long slender cones, the receding grid of broken arms on the ground, the wonderfully three-dimensional horses, the armoured men as systems of solids extrapolated in space - that makes this such a Renaissance masterpiece. ^ "Koos Verhoeff - mathematical art". Ars et Mathesis. Retrieved 8 June 2015.